Are you actually qualified to provide professional carpet cleaning? Yes, we are. We’re qualified through the IICRC (The Institute of Inspection, Cleaning and Restoration Certification), which is a standard-setting non-profit organisation for the inspection, cleaning, and restoration industries, and is an internationally recognised certification. Our money back guarantee is part of our commitment to customer satisfaction. If you’re in any way dissatisfied with the results we produce or the service we provide, let us know and we will re-do the job for free. And if you’re still not happy, we will refund you with every penny. Do you provide carpet cleaning in my area? 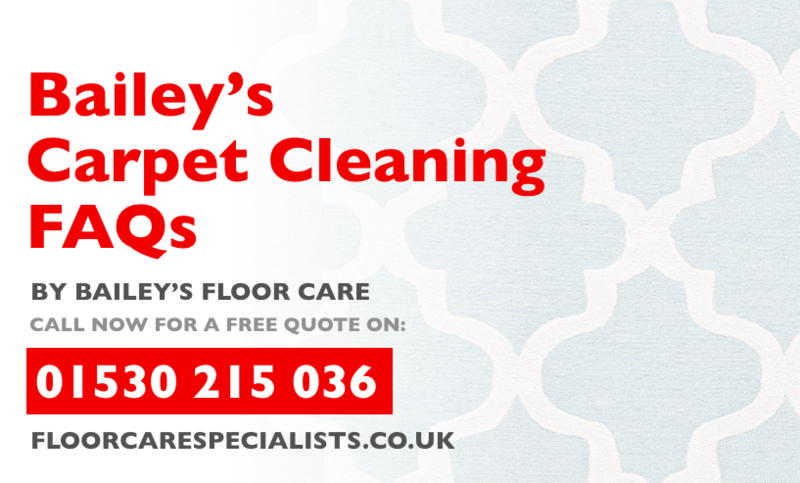 We provide carpet cleaning services in Leicestershire, Nottinghamshire, Warwickshire, Derbyshire, Northamptonshire and surrounding areas. If you’re unsure about whether we cover your area, just send us a message via our contact form of give us a quick call and we’ll let you know. What makes you different to other carpet cleaners near me? Well, a number of things probably. For starters, we’re a family-run company, not a large corporation. So, we love developing relationships with other members of the local community. On top of that, our technicians are extensively trained, fully qualified and highly experienced. Our carpet cleaning services are also deep and thorough, not quick cleans. Are you able to remove tough stains? 99% of the time… yes! We’re capable of eradicating the majority of carpet stains. If there’s a specific stain that you need removing and would like to know if we can assist in removing it, send us a message. What does your carpet cleaning process actually consist of? We actually provide a wide range of carpet cleaning packages, ranging from dry cleaning through to full, truck-mounted hot water extraction cleaning, AKA steam cleaning. We sure do! We’ve been providing professional carpet cleaning, as well as other cleaning services, for more than 15 years now and have cleaned the carpets of hundreds of happy clients. Do you offer carpet cleaning for commercial properties? Yes, we do. We regularly provide carpet cleaning services for commercial properties in Leicestershire, Nottinghamshire, Warwickshire, Derbyshire and Northamptonshire. How long does it usually take you to clean a carpet? Typically, it takes us around an hour to clean 400 square ft of carpet. This can of course vary depending on a number of things, including the current state of the carpet, the furniture that needs to be moved and spotting procedures. How soon after you’ve left can we walk on our carpets? Carpets may feel slightly damp for up to 18 hours after we’ve left, depending on the carpet and soil conditions. This is normal and will not cause any problems, but try to keep pets, children and heavy traffic off the carpet during the drying process. Do I need to move the furniture before you get here? If so, will you charge extra? We’re happy to move your furniture when we arrive. All of our cleaning packages include moving the majority of furniture in the main living area. Most carpet cleaners will charge you extra for this service, but we’re happy to help out for free. Beds, dressers, and heavier pieces are left in place under these pricing structures. Additional charges will apply to move heavier furniture. For liability reasons, we can’t move things like china hutches, entertainment systems, pianos, or other valuable belongings. What is the carpet protection you mentioned? We offer something called Dupont Teflon Carpet Protection with our carpet cleaning services This applies a protective barrier to the carpet’s fibres, which resists moisture from spillages, limiting the chances of stains. It also reduces wear and abrasion caused by git in the carpet, protecting your carpet from excessive matting. Do you have any reviews or testimonials from past clients that I can look at? Of course! You can check out what past clients have said about us here on our testimonials page, or you can take a look at the reviews on our Facebook page.